Browse: Home » Shorefront Anyone? When I was an undergraduate at the University of East Anglia, in Norwich, England, there was a lecturer there by the name of Max Sebald. He was not one of my lecturers, for he lectured in German Literature and I was studying history, but I used to meet him sometimes in the office of the secretary for the German and Russian Departments. He would lounge there between lectures and seminars talking to the very charming British lady who was the German and Russian Department Secretary. Max Sebald knew that I had a German boyfriend and that I went back and forth to Germany on my vacations and summers and we would sometimes talk about things German. My boyfriend at the time was studying in Munster, where Max Sebald had also studied, and we often used to discuss the various points of Munster. “I’ve never seen so many nuns in one place in my life,” I once told him. Munster was in Catholic Germany. The secretary and I both laughed at him when he said this and cautioned him not to divulge his secrets to us. I saw him from time to time in that office and in the halls of the university, but after I graduated and left England, I never met him again. About ten years later, I went into a bookstore on the Embarcadero in San Francisco and found a book, entirely by chance, called The Rings of Saturn by one W. G. Sebald. “Didn’t I used to know someone by this name?” I asked myself. The name was German, of course, so I assumed it must have been someone from my time in Germany. But then I picked up the book, read on the back that it was a description of a walking tour of East Anglia and realized who it must be. I had never known he wrote. The Rings of Saturn is a very strange and wonderful book. You can only imagine the hopeless expression of the poor literary agent trying to imagine how in heaven’s name he or she might sell it to a public hungry for murder and mayhem. The book takes the form of an extended, rambling essay, but an essay which constantly changes from topic to topic as if a child had willfully given their kaleidoscope another twist. Basically, the author walks around East Anglia and discourses on whatever occurs to him, homes that once housed famous men, the flat, windy landscape of eastern England, great cities that once existed there but which were long ago washed out to sea. I thought about this book this week as I sat and watched the images of New York under water, of the contours of New Jersey and Connecticut shorelines changed by waves in a few hours’ time, of a large swath of the eastern seaboard brought, if only temporarily, to its knees. For one of the things, W.G. Sebald wrote about in The Rings of Saturn, was the lost city of Dunwich. If you should travel to England today, Dunwich is a small village perched on the East Anglian coast facing the North Sea. This village is all that remains of the great medieval city of Dunwich, one of the most important ports of Europe in the Middle Ages. Medieval Dunwich, a bustling center of shipbuilding and trade, saw ships come and go every day from London, the German principalities, Denmark, the Low Countries and France. It grew rich on this trade and was able to build a mighty series of sea defenses to hold off both would-be attackers from the east as well as the relentless pounding of the ocean waves. In the end, however, it turned out that the later was the greater enemy. It didn’t stop at that. More devastating storms attacked Dunwich east year, carving churches, monasteries, merchant’s homes, and warehouses off the East Anglian cliffs and into the sea. Over the years, the remaining inhabitants of Dunwich tried to rebuild the town westward, away from the waves. But the ocean was not to be cheated of her quarry and continued to claw away much of what was newly-built as well. Now medieval Dunwich lies completely beneath the sea. 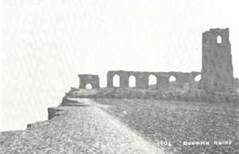 The last building, the ruin of All Saint’s Church, toppled over the cliffs in 1919. And who now has heard of the once great city of Dunwich? Some English history professors, an eccentric German writer, you and I. The loss of Dunwich is a tale that sent a shiver down my spine when I first read it years ago, and which I recalled with a shudder after last week’s storm. Indeed, any resident of the tri-state area would recognize in Sebald’s description of the post-storm chaos of medieval Dunwich an eerily accurate description of the present condition of large sections of the New Jersey, Connecticut and New York shores. So what is to be done? Surely we in 2012 can come up with something more substantial than the stone bulwarks of medieval Dunwich? Perhaps some state-of-the-art flood defenses for New York City? London has them. But what defenses might the shoreline towns of New Jersey or Connecticut build? 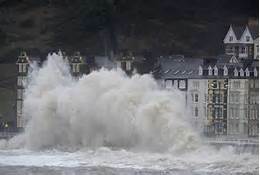 Should people even be living right up against a rising and ever-angrier sea? Will shore-front property retain its cache in the future? Will people who own shore-front be able to insure themselves? Should they? All these questions whirl around in my head, and would have whirled, no doubt, in the head of Max Sebald had he survived to witness what happened this week. And I don’t have the answers to these questions. I only know that I used to read the biblical accounts of the fall of great cities and civilizations with a smug feeling of disbelief. How really could a mighty civilization be brought low by a flood, or an earthquake, or the eruption of a volcano? Surely, the writer had exaggerated, in a child-like way, for the sake of the tale? But now I understand that repeated disasters with not enough time in between to recoup do sap the strength of a people. And as I read the weather report of the Nor’easter on its way for this coming Wednesday and wonder what those still cold in their homes, or others with no homes at all, must feel about it, I grow solemn. For I know they are exhausted and bewildered, and I wonder just how much more devastation they can take. Really nice, Linda! How true, how true. Ironic that having a “cottage by the sea” or “a beach house” now sounds like a liability instead of a luxury. Very sad.